Over the last decade, Cambridge, MA has become a mecca for startups and biotech companies. Drawing in the recent graduates from neighboring universities such as Harvard and MIT, these companies are competing for the brightest young talent. Draper is no exception. Draper is a research and engineering firm specializing in biomedical solutions, Department of Defense research and space systems to name a few. As an independent not-for-profit, Draper’s capabilities include precision instrumentation, microsystems, image and data analytics, and much more. Supported by Dell technology and services, Draper engineers work to solve some of the world’s toughest challenges, like bringing safety to driverless cars and advancing technology in spacesuits to keep astronauts – and eventually firefighters and deep water divers – safe in the event of an emergency. In an effort to modernize its physical footprint, Draper is in the midst of renovating its Kendall Square headquarters. Following a $60M facelift of the atrium, Draper is continuing to look for ways to encourage its employees to develop new relationships and foster collaboration. Behind the physical updates, Draper is also undergoing a cultural shift and IT transformation, all experiences touched upon in a visit to their campus last week. On Tuesday, a small group of local industry analysts experienced a behind-the-scenes look at the multi-faceted transformations Draper has undergone to become a no-brainer recruitment tool for engineers, scientists, you name it, looking to be a part of something special. After all, Draper did help land astronauts on the moon. 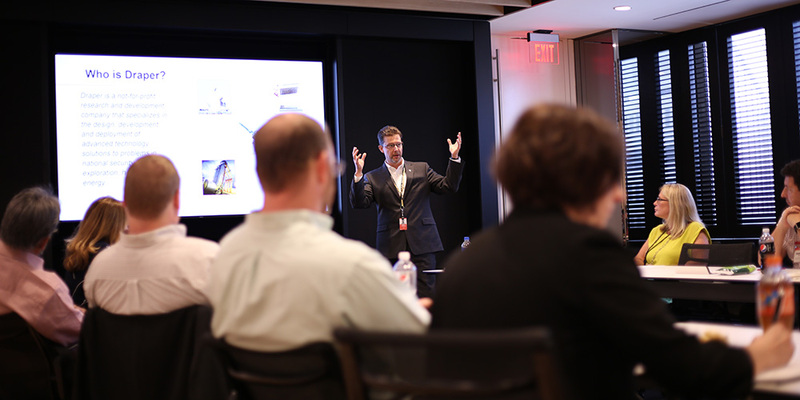 The day kicked off with Draper’s CIO, Mike Crones, shining light on the principles that have driven transformation in the IT organization – people, process and technology. First, it comes down to having the right people and right skillsets, pairing those people with the processes, and then foundationally backing it with technology. Arguably the most influential part of the analysts’ experience was gowning up for a tour of the biomedical laboratory. 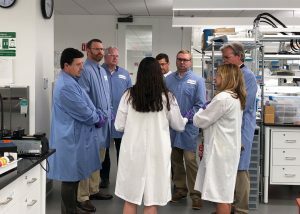 While guiding the group through the lab, Jenna Balestrini, Cell Bioprocessing Program Manager, discussed the power of cutting-edge technology within Draper’s research spaces. For example, Draper is enabling advancements in CAR T-cell therapy with a new device designed to lower the cost of manufactured cell therapies. At Draper, Jenna continued, scientists and engineers come up with concepts from scratch, model the systems, build and test the prototypes and develop the systems to make next-generation therapies that help drive human progress. Products like gyroscopes for autonomous vehicles and guidance systems for the Trident II Weapons system (think military missile testing) are created onsite. At Dell Technologies, we too strive to advance human progress. We are proud to partner with companies like Draper who are at the forefront of innovation every day.